My New Year’s Resolution is an easy one this year. I want to lose weight without having to worry about calories, carbs, or fats. I want to lose weight by doing nothing more than simply eating better and doing a modest amount of physical activity. To achieve this seemly “miracle method” of weight loss, I am focusing on eating whole, natural foods. To kick start my resolution, I decided to complete a detox routine. The only problem with that is I dislike the idea of restricting myself to juice fasting. I don’t believe that is a healthy way to support my body. After all, we are meant to eat. We’re just not meant to eat the processed food and fast food that we seem to consume in great quantities. I was in luck, though, as Victoria Laine, nutritionist and author of two cookbooks (Real-Life Vegan and best-selling Health by Chocolate), offered a half-day workshop titled “Real-Life 3-Day Food Detox.” That sounded like my kind of detox. With Laine’s eBook, Real-Life 3-Day Food Detox (given to workshop participants) and her latest cookbook, Real Life Vegan: 10 Weeks of Complete Whole-food Meals with Gluten-free, Vegetarian, and Meat-lover Variations! (also part of the workshop material), I was ready to begin. I needed to buy only 16 ingredients to be ready for the three days of detoxing through eating selective food. On that first day, I weighed myself. The goal of a detox is to cleanse the body, not lose weight. However, I wanted to see if there would be any change in my weight. Even though Laine provides hints on how to prepare some of the food prior to starting the detox, I didn’t have time. And I didn’t want to use that as an excuse to delay starting. So I dove right in. 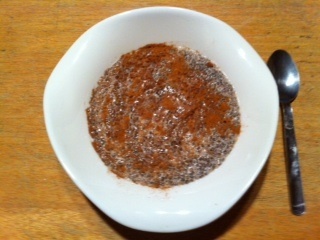 The breakfast for all three days was the same: Chia Raspberry Breakfast, found on page 208 of Laine’s cookbook. The original recipe looked much nicer and had a much better texture than the variety I made for the detox. I had tried this breakfast a few weeks prior, using diary-free yogurt as called for in the recipe. This time I didn’t buy any yogurt, instead, thinking I would use what I already had in the fridge. On the first morning of the detox, however, I realized that the yogurt I had in my fridge was not dairy-free. And dairy is one of the types of food that is to be avoided during detoxes. So I made the Chia Raspberry Breakfast with almond milk instead. The almond milk created a runny texture, which was not as pleasant as the original recipe. I was hoping that it would thicken as it set. So I put it in the fridge to chill and made my lemon water. Laine’s detox calls for lemon water before any other liquid or food enters the system. I had discovered a delicious lemon water drink a few weeks prior and choose to stick with that one for this detox. I cut up a two-inch piece of ginger and put it into my blender with half a lemon. After adding 1.5 cups of water, I blended the mixture until it was frothy. Hmmm, hmmm. Delicious. My new favourite way to start the day. Because the Chia Raspberry Breakfast needed to set a few hours before eating, I decided to have a piece of fruit as my snack first. I chose a banana, the “evening snack” according to the detox instructions. I didn’t think it would matter if I had the banana in the morning and the “mid-morning snack” of grapefruit or apple in the evening. Just as long as I ensured I ate the fruit in order to provide my body with the nutrients they offer. After waiting an appropriate length of time, I ate the breakfast. I did not really like the original the first time I had this recipe. And I didn’t like the current almond milk variety any better. I found the chia seeds to be quite tasteless. I even tried blueberries instead of raspberries for the second day of the detox. That didn’t improve the taste. On the third, and final, day, I grabbed an old stand-by: maple syrup. Even after setting for three days, the mixture never did thicken. And the maple syrup simply added more liquid to an already runny meal. Even so, the maple syrup definitely added a pizazz to the taste. 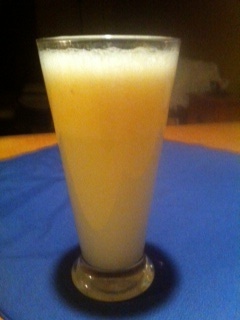 My new favourite way to start the day: frothy lemon ginger water. I probably shouldn’t have started my Detox Blogs with the only recipe that I didn’t like. Since it was the first recipe I ate, it was the most logical place to start. This breakfast recipe is the only one from Laine’s cookbook that I have tried that I doubt I’ll bother with again. Laine’s cookbook has a wide variety of breakfast ideas, so next time, I’ll start with something else. Watch for my next blog when I continue with the 3-Day Detox. Coming up: Mint Mojito Mocktail and Sea Veg Salad. My mouth is watering in remembrance as I type this.